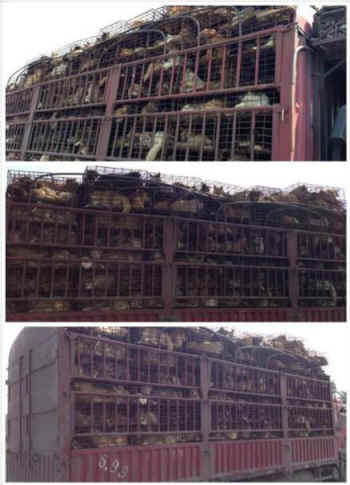 Animal welfare activists in China have stopped a truck carrying 900 dogs due to be slaughtered for their meat. The truck was spotted in the Qijiang District of Chongqing, and the driver was forced to pull over. Of the wide array of pedigree and mixed breeds discovered on board, many still had tags or collars, meaning they are likely to have been stolen from their homes. 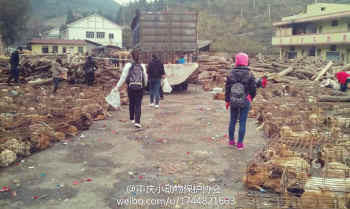 The dogs are believed to have been on route to Zhanjiang in Guangdong province to be slaughtered. 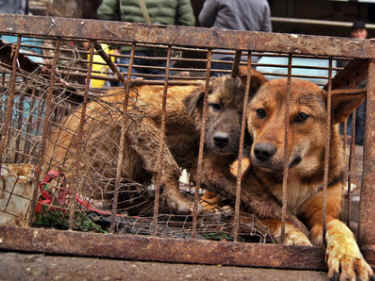 Mr Chen Mingcai, director of Chongqing Small Animal Protection Association, reports that many of the dogs were suffering from disease such as distemper and others had died in their cages. As the news spread, people who had lost their dogs travelled to the scene in the hope of being reunited. While some were lucky, most of the dogs are now being cared for by Chinese welfare groups. Animals Asia has provided advice to the Chongqing Small Animal Protection Association on appropriate rescue protocols. Meanwhile, it has also been reported that the two veterinarians who issued the inspection and quarantine certificate” allowing the dogs to be transported have been suspended for investigation. These initiatives by Chinese activists are just a small part of a growing movement within China showing great dedication from many Chinese people to the welfare of animals. The cruelty and illegal aspects of the trade are also becoming an area of concern for the media and public too. This consumption of cats and dogs has become a black market industry with domestic animals and strays being abducted in order to create a zero-cost business. It’s clear that these so called ‘meat dogs’ wouldn’t actually meet food sanitation standards and are not fit for public consumption. Tragically, many of the dogs had distemper and other diseases and died on the truck. Had these dogs made it to the dining table, there could have been severe implications for human health. Pictures courtesy of Chongqing Small Animal Protection Association, having originally appeared on the Chinese micro blogging platform Weibo.